You’re definitely not alone in your concern for hair loss. At Serrão Rejuvenation Center, Dr. John Serrão, a board certified gynecologist and post-graduate trained cosmetic surgeon, offers hair restoration treatments in Orlando, Winter Park and the surrounding areas of Florida. About 30 million women in the U.S. are suffering from hair loss, representing 40 percent of all hair loss cases nationwide. Women can experience hair loss, thinning, and balding at virtually any age and for a variety of reasons. Serrão Rejuvenation Center offers several treatments for hair restoration for women. At Serrão Rejuvenation Center, we understand that losing your hair can be devastating. In fact, about half the women that we treat all have concerns about hair loss. Studies show women who struggle with balding or hair loss are more likely to experience changes in the quality of their lives, including a loss of self-esteem, feeling less attractive, and increased stress in social interactions. We are dedicated to serving as a resource for you to better understand your options and helping you regain your confidence by restoring a full head of hair. Though traditionally, hair loss treatments have targeted men, the good news is many of the same solutions work for women as well. If you are suffering from hair loss, know that Dr. Serrão and his team can help you with proven non-surgical options. 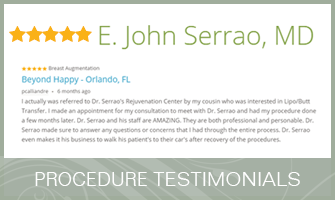 At Serrão Rejuvenation Center, Dr. John Serrão, a board certified gynecologist and post-graduate trained cosmetic surgeon, offers hair restoration treatments in Orlando, Winter Park and the surrounding areas of Florida. Contact us today to schedule a consultation and learn more about our specialized hair restoration services for women. Begin your rejuvenation today!